During couple of last weeks, a magnificent sunspot group, named AR 2192 was growing in the surface of the Sun. This sunspot group was largest in more than 20 years, and it was largest sunspot group during this sunspot cycle! This sunspot group was so large, that Earth could have been fitted ten times in the sunspot! I was also able to observe this sunspot, and I was also able to see it with naked eye (of course with proper solar filter)! When I was doing my observation, Sun was already at low altitude, and thus it was a little bit flattened and seeing was quite poor. I took this photo with Canon EOS 1100D DSRL and with 4” refractor. Hello you all, and wonderful and the most succesfull new year! Year has changed, but the weather hasn’t changed much. It has been continuously cloudy here in Finland, and I haven’t got any observing chances this year – yet. Nevertheless, I made some summary and statistics of last year’s Solar observations. So there has been some activity in the Sun! The most active month was July, when the monthly average of R peaked in 51.05! 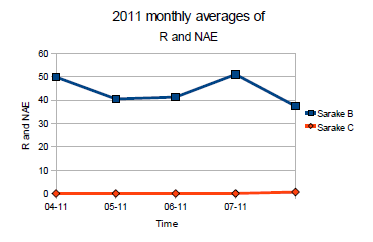 The highest monthly average of NAE was recorded in August, when it was 0.6. For complete statistics, please have look at here! During the August, weather was not so favourable as it was in July, and I was able to make only 18 observations, which is still quite good amount! In August, It was possible for me and for many others to witness the growth and fading of couple of gigantic sunspt groups in early August. Actually, those sunspots groups were so large, that it was possible to see them with naked eye! Actually I was able to see them in four days in row in early August. I made NAE observations in ten days in August. The average NAE spot number in those days was 0,6. But the total amount of my observations was 18, and it is very reasonable to assume, that there wasn’t any NAE spots in the Sun after the four first days of August, which means that my NAE average would be 0,3 (2+2+1+1/18 = 0,333). Besides those gigantic spots, there was also the second spotless day of this year in August. (according to Spaceweather.com there has been one spotless day in this year before august), that happened 14.8. After that, the amount of sunspots was going up again. It is reasonable to assume, that this August might have been the last complete month with solar observations for me this year. The reason to this is the fact that winter is getting closer, and the altitude of the Sun is getting lower and lower and also the weather might not be so good during autumn that it was in summer. I think it is possible to do at least some solar observations in early september, but after that, I think the solar observing season is over for this year. In July the Sun was shining much, and I was able to do observations in 20 days. The Solar activity has been in high level during July, and I got the highest monthly average so far this year in July, the average Wolf’s number in July was 51,05. Nevertheless, there was a short period with quiet activity in late July. Anyway, the activity was increasing again during the last days of July, which was also indicated by the birth of three gigantic sunspot groups, that are still visible in the Sun while I’m writing this! For example Spaceweather.com -site was reprting about those huge sunspots! And actually I when I was cheking the sunspots today, I was finally able to see two of those gigantic spots also with naked eye! In June, I spent most of my time in municipality of Kuusamo, in NE Finland, where my observing site was a famous holiday resort, Ruka. Nevertheless, I wasn’t having a holiday there but working! Anyway, scenary was absolutely stunning and beautiful and it was almost just like having a holiday! 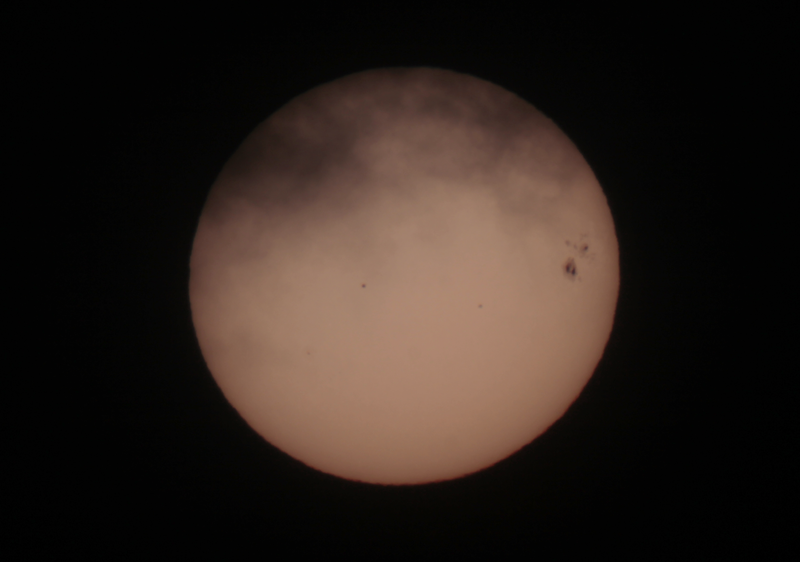 In June, I got many chanches of making observations of sunspots. Actually, in June I was able to make in total 18 observations, best amount of observations so far during this year! In very early June, solar activity was high, and the Wolf’s number was over 100 for couple of days. And then to mid June, Wolf’s number was going down, and it fell under 20 for couple of days, but then it went again up to 40 around mid June. Around Midsummer festival I wasn’t able to make observations, but during the two last days of June, Wolf’s number was slightly over 30. In may Sun was shining in many days during May here in Finland. 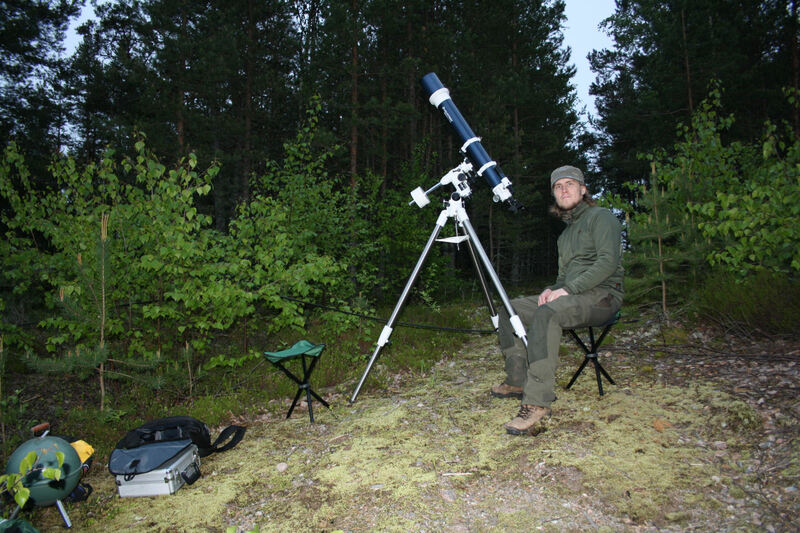 In the beginning of May, I was unfortunately in Southern Finland, where I didn’t have proper equipment for solar obsevations, so there is a gap in observation series. And when I came back to Sodankylä, there was a cloudy period of several days, so I wasn’t able to make observations. Nevertheless, I was able to make observations in late May. In late May, there was a quiet period with very little sunspots for three days, but in 26th of May the activity began to rose again. In the last days of May, the sunspot number was nearly 100, and there was a one large sunspot producing relatively large flares which caused aurorae. According to Spaceweather.com, many observers have made aurora observatios in the midde latitudes of both Northern- and Southern hemispehres. For example, observatios have came from Alberta, Kanada, Tasmania and New Zealand.